Foot Pain Specialist. Restoring comfort to your feet and the spring in your step! Verruca or plantar warts, are benign neoplasms confined to the outer layer of the skin. Although they are found mostly in the younger population, they can occur at any age. The human papilloma virus (HPV) is the cause of warts and has 46 distinct types, each resulting in a slightly different type of wart. Some warts may undergo spontaneous resolution, while others may last a lifetime and are very resistant to treatment. The virus is contagious and is often transmitted in areas of public use, such as locker rooms and swimming pool areas. It enters the skin in areas of mechanical abrasion or trauma. What are the types of treatments? As the source of the problem is a virus, it is your own immune system which will fight it off. However, the majority of treatments are designed to cause trauma to the area infected, which causes your immune system to target the area. Treatments falling into the following areas: mild chemical burns (salicylic acid, Silver Nitrate), freezing, heat (laser treatment) or complementary therapies. In the FootMan's clinic, we manually remove as much of the verruca as possible, and apply Silver Nitrate. This shrinks the skin, making it hard and easier to physically remove further, causing further trauma to the area for your immune system to fight the virus. This is normally less painful than using the over-the-counter treatments using salicylic acid. How can I prevent catching a verruca? Always keep your feet covered when you are in a communal area (e.g. sports changing room or swimming baths changing area / showers. If you have any broken skin on your feet, always keep it covered with a waterproof elastoplast. This will keep it clean and help prevent many infections. Never use anyone else's shoes or towels. I think I have a verruca! What should I do? 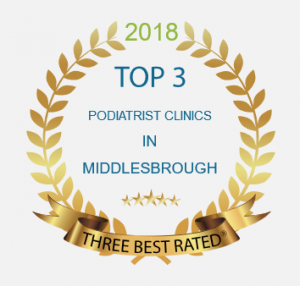 Have it examined by a registered podiatrist / chiropodist or your doctor. Once it's been correctly diagnosed, have it treated and monitor it for any increase in size or colour. Keep it covered at all times to prevent spreading it to other people. Do not share your shoes or towels with anyone else. If it becomes larger, more painful or changes colour, contact your podiatrist or doctor immediately. Want more information? Read my blog on Verrucae. New Year Goals Not Quite On Track?